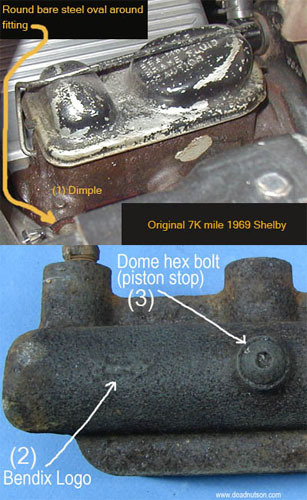 Production master cylinders for 1969-1970 Mustang/Shelby with power disc brakes are identified by a dimple near the front outlet (1), Bendix logo cast into the bottom (2) and a dome hex head bolt (piston stop) on the bottom (3) The master cylinder, brake booster and cap were Painted semi-gloss black as a whole unit. Plugs were used to keep spray paint from the threaded outlets so you will see a round bare steel circle around each exit. In the upper picture (original 7K mile Shelby) you can see that it didn't take much brake fluid to remove the light coat of black paint on the master cylinder itself although a white paint dab did survive. Boss 429 only notes: Boss 429 cars had a unique master cylinder with a larger piston bore, larger outlet ports and a hex headed stop screw. They also had a unique brake pedal and support identified by an spray painted orange dot. The rear tie-down brackets were a piece of hardware that should not be on your car but it usually was. This is because they were supposed to be removed by the transportation or dealer prep guys before the car was delivered to the customer per the decal placed on the rear license plate mounting location. The ones shown in this picture are the duel exhaust type, the single exhaust type doesn’t have the third mounting tab and they are smaller. We suspect most of them stayed on the cars because the credit given for there return wasn’t worth time it took to remove them. The originals had a bare steel finish and the bolts/nuts were phosphate plated. It's not uncommon to see original duel exhaust cars that only have the two bolts that go through the frame to keep the bracket in place. 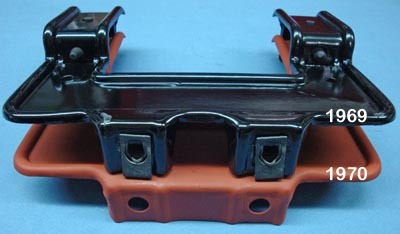 The previous picture of the rear tie down bracket showing the two round paint less areas on the rear frame rail were created by assembly line body buck contact points. During assembly the Mustang body was mounted to a special frame “body buck” that carried the car down the line as it was assembled and painted. 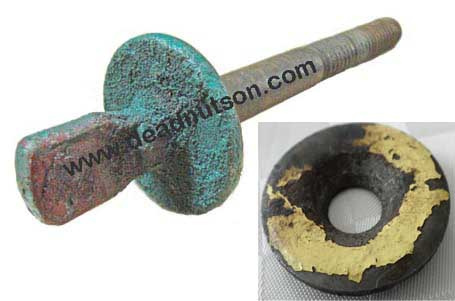 This bolt and washer was used to attach the body to the assembly line buck. The factory buck bolt shown here with heavy paint build up from years of over spray was found by Ed Meyer many years ago. It's one of three known to exist. The washer shown was never removed from Pat Whalen's Dearborn built 1970 Boss 302 so we know its exact measurements (1.750" OD and .500" ID). 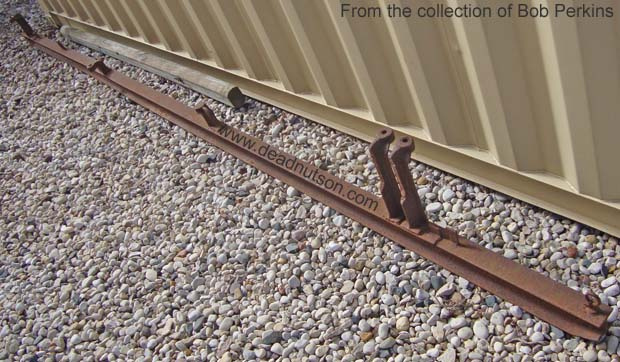 Lower picture is a body buck rail from the Ford Plant. This body buck is part of Bob Perkins collection. What is a Dearborn Radiator Cap? It’s the radiator cap that came on all (exceptions may exist) 1969-1970 Mustangs built at the Dearborn Michigan plant. This is one of several parts that are considered plant specific. Ford had several vendors for each common critical part and sometimes the vendor closest to the plant became that plants sole supplier if they were able to keep up with that plants needs. Originals are nearly impossible to locate and are very expensive. I have posted this picture so you can see the differences between the reproduction and an original. 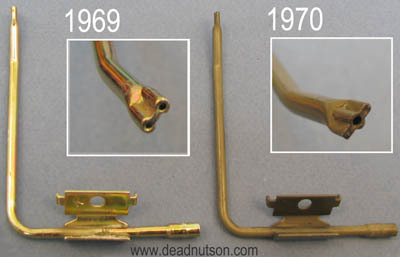 The 1969 hood latch striker was phosphated and the 1970 striker was zinc dichromate plated. Both will function on either year. It’s easy to tell them apart when they are together. I always look for the area pointed out with the arrows shown to tell the difference. It should be noted that we have found both strikers on late 1969 and early 1970 production Mustangs. We have also found that most all Shelby's made in late 1969 production had the 1970 type of striker. We are always asked what is the correct upper radiator support bracket for my car? 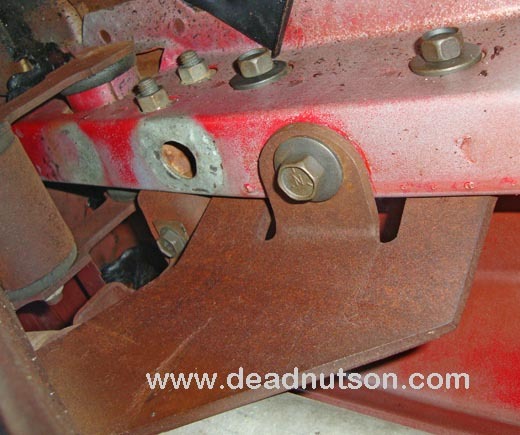 The brackets are exactly the same except for the screw mounting section was bridged in 1970. We suspect Ford had some kind of problems with the 1969 bracket (C9ZZ-8A193-A & C9ZZ-8A193-B) so they simply bridged the mounting section to improve it’s strength and gave it a new engineering number (D0ZZ-8A183-A). We have never seen a 1969 bracket fail in any way but maybe in extreme conditions it did so it was improved for 1970. 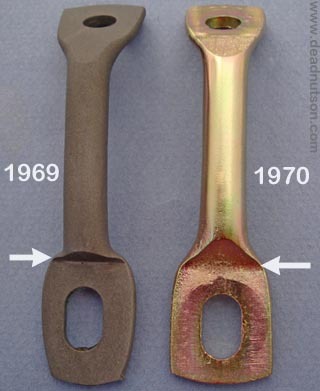 In 1969 the rear leaf spring shackle used fine threaded stud but in 1970 Ford engineers changed to a coarse thread (16) and the threaded portion of the stud was also longer. Other than these minor changes nothing was different. Maybe this "production enhancement" was made to make the shackle more durable, coarse threads are more tolerant of abuse and will assemble and disassemble more easily and quickly than fine threads and are less likely to cross thread. In 1971 the thickness of the shackle plate steel was increased considerably and they went back to a fine thread. After 1970 Ford serviced 69-70 shackles with the 1971 shackle (D1ZZ-5630-A) so finding any correct NOS shackles for 1969 and 1970 Mustang/Shelby is very difficult. Correct finish is bare steel. 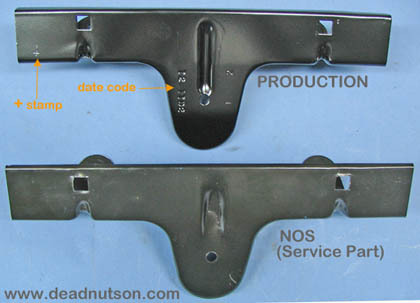 As you can see there is a big difference between a NOS (service part) version and an original production front license plate bracket. The first thing I look for on originals is the deep groove in the middle and a date code. The pictures really explain the differences so you don’t really need me to blab on what the differences are. 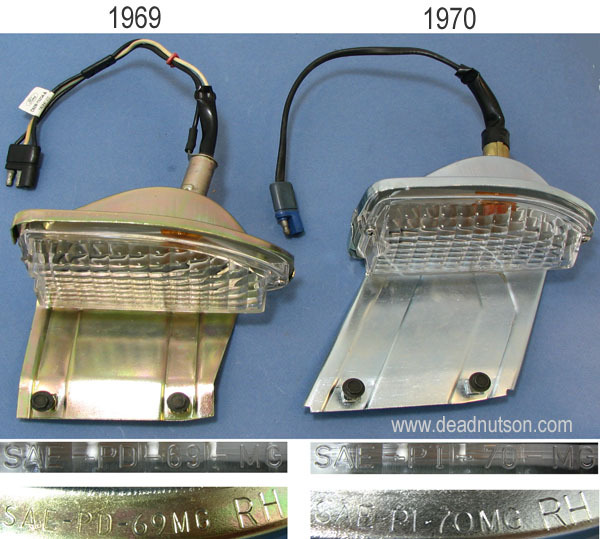 As you can see the 1969 front turn signals housings were plated zinc dichromate and the 1970 housings were silver zinc. The bracket/housing consist of two pieces spot-welded together. The rear section of the two-piece housing used to mount the lens is the same between the two years (except for engineering number) but the bracket section used to mount the assembly is very different (see picture). The lenses are exactly the same except for the SAE year code. The only lens reproduced today is the 1970 lens. The 1969 lenses are very difficult to find today since they only were serviced for one year until they were superceded by the 1970 version. The 1969 wire harness has three wires, one extra wire for a ground. 1970 versions and later 1969 NOS (service parts) only came with two wires. Only real early 1969 Ford Autolite service versions had three wires. This is the easiest way to tell if you have true production 1969 front turn signal lights. 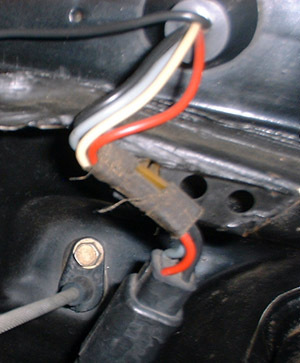 The 1970 production wire harness had a blue rubber socket. 1969 production wire harness came in three slightly different configurations but they all had three wires and black rubber parts. Many collectors are confused when it comes to determining the correct plating for their front turn signals because over the years Ford would service both years with silver zinc brackets and then later service them both with yellow zinc brackets. This is another good example why you should always question anyone who uses NOS parts to prove a correct finish or construction. Production C3AZ-4635-G, C3AZ-4635-H u-joints are easily identified because the center is dished out on each side and there is no grease zerk. 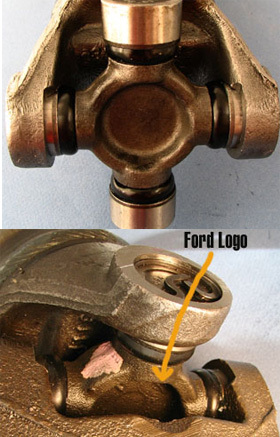 On one side you will usually find a faint Ford logo but not always because the forging die was dirty or just worn out (see lower picture). Its common to find a tiny redish orange and purple paint dob in the center of production originals. These u-joints are very rare today because they where only found on production driveshafts and older NOS service replacement driveshafts. Is your car judged? Zerkless u-joints are good for 1 point in MCA concours classes. This is another case where production parts were not the same as service parts. We recently reproduced these u-joints if you need a set. Click on the part #'s below. Production reverse lights and Ford service (NOS) reverse lights are not the alike. The housing is the same but the lens would be incorrect for 1969 cars and the wire harness was thinner in construction they used decals for the engineering number instead of stamping the wire itself (see exploded view of wire). There were many changes in the wire harness while the backup light was serviced by Ford over the years but it never looked exactly like the production version. Backup lights changed to a thicker lens starting on 2-28-69 (per Ed Meyer) by adding a second thin 69 lens. The Master parts catalog put the change over date to the thicker lens on 4-7-69. It may be impossible to say exactly when the cut over date occurred since it would hinge on when the remaining stock of thin lens was exhausted. According to Ed and the MPC you would be safe to use the thin lens before 2-28-69, double-upped lens from 2-28-69 thru 4-7-69 and the thicker lens after 4-7-69. You can find plenty of NOS 70 lenses around but it's difficult to find a set of NOS thin 69 lenses because they only serviced them for less than a year. One way to get a NOS looking set of thin 69 lenses is to find an original set of backup lights that were doubled up and use the lower lens. Ford made a right and left versions because the rear valance is rounded slightly. You can tell the difference by the main housing itself and by looking on the back of the main housing for an R or RH and L or LH cast into the housing. We found one documented original San Jose 69 Mach 1 built on 3/18/69 that had three 69 thin lenses stacked. 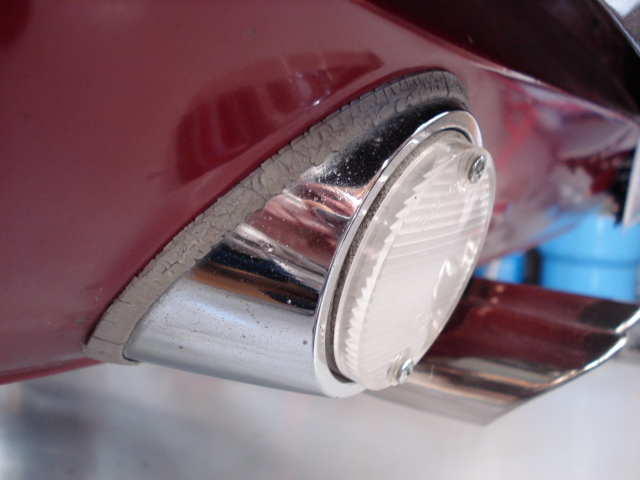 The outside lens protruded out from the chrome housing. When the owner took the lenses off he found the lower two lenses were like new. 8-27-13 update: A customer confirmed his 11,000 mile Dearborn 1969 Boss 429 (March 5th 1969 build) also had the tripple lenses. On almost every restoration I've seen the windshield wiper motor harness is taped incorrectly to its clip or not at all. This picture of an original 7,000 mile 1970 Shelby is a great example of how it should be done. In the picture it's hard to tell but the cloth electrical tape is 1/2" wide (most standard cloth electrical tape come 3/4" wide). Start by wrapping the tape around the wires by themselves to hold them together at an angle (see tape in the middle of the two end wraps), then continue to wrap one end of the clip 2-3 times and cut. The other side of the clip was wrapped 2-3 times and cut. In some cases they would cross over to the other side of the clip without cutting the first side. There were many methods used to wrap this wire harness but this way seems to be the most common. The windshield wiper harness was clipped into the far left hole on almost every original car we’ve seen. 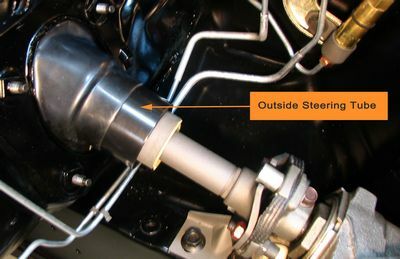 The correct finish for 1969-1970 Mustang steering column tube that extends into the engine compartment is the same as the steering column inside the car. That little bit you see in the engine compartment is simply the end of the steering column tube you see inside.A common restoration mistake is to paint this part of the tube semi-gloss black. The inner tube and the steering shaft was natural bare steel (done in phosphate for rust protection in this picture). Original production spring clamps used for fuel lines, vacuum lines (1970) and brake booster hoses are different from the ones available today. 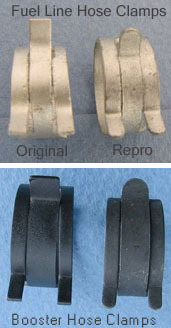 In the picture of the fuel line clamps you can see the original clamp (left) has longer squared off tips and the reproductions are rounded and shorter. The correct finish for the fuel line clamps is silver paint. The correct booster vacuum hose clamp finish is black enamel paint (finish code S22) per assembly manuals. Ford used this type of clamp for the booster hose until sometime in 1972 when they changed over to one that had shorter squared off tips and then later changed to the round tipped version we see today. If anyone has ever slipped a wrench and hit one of these clamps with their knuckles understands why restores call them the knuckle buster clamp. I would imagine this is why the manufacture of the clamps eventually went to the rounded ends we see today. 1969 Mustangs and the 69-70Shelby windshield wiper nozzles have two holes in the nozzle head and were plated yellow zinc dichromate. 1970 Mustang windshield wiper nozzles had one hole in the nozzle head and were plated olive drab. Both years used the same soldered on mounting bracket with a large K stamped on the flat surface facing out. The 1969 version stayed in production until September 2, 1969 according the Master Parts Catalog. This means if you had an early 1970 Mustang the 1969 style nozzle can be correct. We will never know when each factory ran out of the 1969 nozzles and started to use the 1970 nozzles. What's An Olive Drab Finish? Olive drab is not paint. Its a dichromate chemical conversion finish similar to yellow dichromate. Dichromate is applied after the part is plated with zinc. Yellow dichromate will not show signs of rust until it’s exposed to 96+ hours of constant salt-water spray. Olive drab dichromate will last 150 hours before rusting. Find a plater that can do yellow zinc dichromate (1969) or olive drab (1970). Make sure you clean the nozzles holes good before you have them plated so the chemicals flow freely threw them. When you get them back from the plater clean the nozzles out again to remove any residual acids used in the plating process.